Join Arthur Curry on his extraordinary adventures as Aquaman in the latest slot release from Playtech and enjoy super-powered rewards along with life-changing progressive jackpots. Arthur Curry grew up in the small town of Amnesty Bay where he was the lighthouse keeper before he transformed into an extraordinary superhero. He is the son of an Atlantean queen and the King of Atlantis. He is also considered to be founding member of the famous Justice League and is one of the most popular superheroes in the DC universe. Aquaman also recently received his very own video slot, thanks to Playtech, allowing you to experience the exciting life of Aquaman as he showers you with sensational rewards and phenomenal cash prizes on every spin. 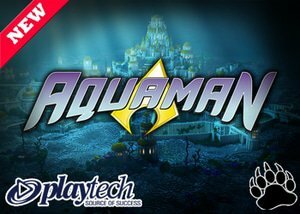 The new Aquaman slot from Playtech online casino software is well produced, featuring a 5x3 reel structure along with 243 Ways to Win. The Aquaman slot also comes equipped with a sensational range of underwater features, including Atlantis Free Spins, Ocean Rush Re-Spins, Trident Wild Re-Spins, and a DC Superheroes Jackpot game along with four progressive jackpots up for the taking. The Trident will act as the wild icon on the reel set, standing in for all symbols, apart from the scatter icon, to form winning combinations. The Trident wild symbol will also multiply your winnings whenever it forms part of a win. Players will also appreciate the fact that the slot comes equipped with a Trident Wild Re-Spin feature. This bonus feature is activated whenever the stacked Aquaman symbol completely covers the second reel. He will then throw his trident across the reel set during a re-spin feature, turning three adjacent icons into locked wilds. The reels will continue spinning with locked wild symbols until a winning combination is triggered. The game further impresses with an Ocean Rush Re-Spin feature which can be triggered whenever a stacked Mera completely covers the fourth reel. Once triggered, she will randomly select a symbol which she will lock in place and grant you one free re-spin. Should the same locked symbol appear on the reel set during the re-spin feature, they will also lock in place where you'll receive an additional re-spin until no new locked symbols are presented on the reels. In addition, should the stacked Aquaman cover the second reel during the Ocean Rush Re-Spin feature or a stacked Mera covers the entire fourth reel during the Trident Wild Re-Spin feature, both re-spin features will be activated, providing the opportunity to unlock a few extraordinary winnings. Apart from the two Re-Spin features, the game also boasts with an exceptional free spin feature which can be triggered whenever you display a minimum of three scatter symbols on the reel set. Once triggered, the Atlantis Free Spins round will be activated, awarding you with 8, 12, or 16 free spins whenever you display 3, 4, or 5 scatter symbols. During the free spin feature, you will need to collect golden Aquaman icons to transform the villains into Aquaman, leading to some explosive winning opportunities. Lastly, the slot features the world-famous DC Superheroes Jackpots, allowing you to walk away with one of four jaw-dropping progressive jackpots. The progressive jackpot feature is triggered randomly during play where you'll be presented with 20 Jackpot icons. You merely need to select one of the 20 symbols to receive either the Grand, Major, Minor, or Mini Jackpot. The new Aquaman slot from Playtech comes equipped with 243 Ways to Win, eliminating the opportunity to adjust the paylines featured in the game. However, the slot does provide several coin values which you can alter, giving you a minimum bet of only $0.25 per spin along with a maximum bet of $500 per spin, making it ideal for high rollers and newcomers alike. The new Aquaman slot comes with a bunch of superhero-themed symbols to further compliment the overall look and feel of the game and include Aquaman himself, paying the highest jackpot bonus in the game, along with Mera, Black Manta, and a variety of high playing card values as low-paying symbols. The new Aquaman slot comes with a 96.33% return to player ratio and is available at all Playtech casinos from November 2018. We suggest that you play the new Aquaman slot at Slots Million Casino where you'll be greeted with a phenomenal welcome bonus along with several other DC Comics online slots from Playtech.